A spate of fatal knife attacks in the UK has sparked a debate about youth violence and gang culture in the country. But is the UK's experience mirrored in other nations? BBC correspondents compare situations around the world. Spain's Ministry for the Interior does compile separate statistics for knife crimes, but not because crimes with knives are on the rise. According to government statistics, 135 people died from knife injuries in 2007 and nearly 488,000 knives were confiscated by police. Those figures do not represent any significant change compared to previous years and guns remain the preferred lethal weapon. Any worries about knife crime in Spain tend to be overshadowed by other crime concerns, like violent burglaries by gangs, including Russian and Eastern European groups. They are known to target wealthy residential areas and often use firearms to threaten their victims. Knife related violence can feature among Spanish and Latin American street gangs who are seen by some as a growing urban problem. Some reports in the media suggest that violence involving knives - especially resulting from fights among teenagers and young men - has increased dramatically in recent years. But in that context, there is not a wave of knife crime and it does not seem to overly preoccupy the authorities or the wider community. In Japan there is great concern about what is perceived to be a rising level of knife crime. 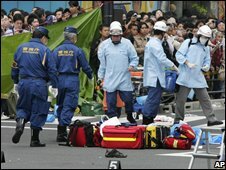 In June a man ran amok in a Tokyo shopping district, killing seven people and injuring seven more, stabbing his victims with a double edged hunting knife. Sadly, such incidents are not as unusual here as they once were. Newspaper reports say the National Police Agency is now considering whether carrying a double-edged knife should be outlawed. These knives are often depicted in Japanese video games. The fear is that the games make them popular with young people. Japanese law already prohibits people from carrying a knife with a blade 6cm (2.4in) or longer unless they have a good reason to have it, although it's not illegal to possess a knife that long. Reports suggest that in 2007 there were 40% more knife crimes than there were five years earlier. But the numbers were still pretty low compared to other countries - fewer than 5,000 violations of the knife crime law in a country of more than 127 million people. New York City has a reputation for being an edgy, sometimes dangerous city. But in fact it is one of the safest big cities in the United States. Over the past 10 years violent crime has fallen by 41%. Murder rates in the city are currently at their lowest rate since 1963. Like other dangerous weapons, carrying a knife in New York City is illegal, but knives are not perceived as being a specific problem on New York City streets. Efforts to stop violent crime here tend to focus more on guns, and the legislation to restrict their sale and possession. The most recent tactic that the New York City Police Department (NYPD) has used against violent and petty crime is called Operation Impact. It focuses on targeting crime on a very local level, sending lots of police officers to very specific trouble spots such as housing estates or shopping malls. In Denmark there are strict rules as to the length of knives that can be carried in public and police have broad powers to search individuals without due cause. At a maximum length of 7cm (2.7 inches), almost all sharp instruments that can be used to stab are forbidden in public places. The rules do not apply to certain trades, such as fishermen or others who require knives as the tools of their profession. However, tradesmen are advised to leave any sharp tools elsewhere when visiting pubs or public places, and are liable to be fined if knives, screwdrivers or other instruments cannot be proved to be necessary at a location. Copenhagen and other major cities have been designated as special search areas where police have the right to institute body searches at any time. At the same time, Justice Minister Lene Espersen has suggested that police introduce more CCTV to stop crime - particularly knife crime. Despite these measures, however, the level of crime in which knives are involved has remained the same - 2-3% of all violent crime - according to figures from the Crime Prevention Council. An unfortunate development, according to police, is that when knives are available they are used more frequently and with more devastating effect. Latest figures show that 2,549 illegal knives were confiscated in 2007, while 3,113 were confiscated in 2006. Knife crime has not been singled out so far by Russian authorities or the population in Moscow as being a particular problem. Instead, the Ministry of Interior provides country-wide statistics apparently showing that the number of crimes committed using a weapon of any kind dropped by almost a third in the first half of 2008 - taking the total to fewer than 5,000 incidents. But this extremely low figure does not tally with what non-governmental organisations investigating specific types of crime are finding from their research. Take for example the latest figures from Sova, a non-governmental organisation (NGO) which focuses on racist violence in Russia. It says the number of racist attacks is increasing by 15-20% every year. From January to May this year, 59 people were murdered and more than 200 injured. Most of these racist murders were in Moscow and most involved the use of knives. The police themselves admit that knives are the weapons of choice for gangs of skinheads. And yet in Russia there is no clear legislation banning the carrying of knives on the streets. France has seen no equivalent of the wave of fatal stabbings in Britain, and newspaper reports on the so-called "culture du poignard" (knife culture) reigning in London and other big cities are read with universal horror. But experts warn there is no cause for complacency. Where Britain has gone, France could all too easily follow. According to Alain Bauer, France's leading criminologist, the carrying of knives and other weapons by adolescents is widespread in many poor neighbourhoods. And if the number of murders nationwide remains relatively low (on average around 1,000 a year, of which only about 35 by minors), there has been a huge increase recently in acts of violence carried out by minors. "One big difference here is that our gang culture is directed mainly against representatives of the state. In Britain, it is more internecine," says Mr Bauer. "In general, here in France we haven't reached the point where knife-carriers move to the actual deed. But it's probably only a question of time." According to Mr Bauer, Western societies are all caught in a similar pattern of youth violence, which he says is linked to a collapse of confidence in authority. "Across the West, we have a set of moral references that date from the 18th century, 19th century laws, 20th century police - and 21st century violence," he says.